Playing with sidewalk chalk is one of my kids favorite summertime activities. And I’m always looking for fun ways to teach my kids their numbers, colors, the ABCs, following directions, hand-eye coordination, etc. So why not combine the two? you can do with sidewalk chalk! Number Game: Write out the numbers with corresponding dots underneath. Then, have your child count, stomping on each number as they go. Or tell them a number to run to. Or have them count out the dots with their feet. It’s so simple, and the kids love it! 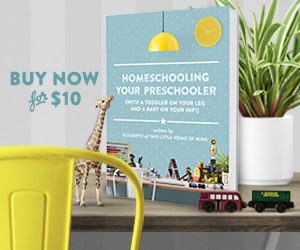 Telling Time: Teach your child to tell time with sidewalk chalk and other objects. 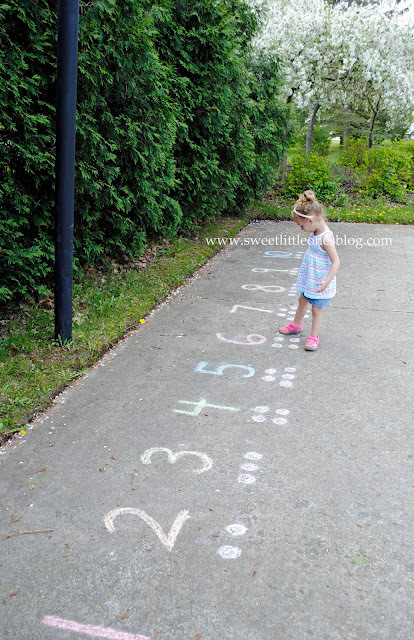 Gross Motor Addition Game: Have your child add up the total on the dice, and then have them hop to the number. Snail Hopscotch: A circular twist on a classic game. Alphabet Game: Write out the alphabet. Have your child say their ABCs, stomping on each letter as they go. Or have them spell out a word or their name by standing on each letter in the correct order. Or tell them a letter to run to. You can do a lot with this game! Alphabet Hop: An alphabet board game, but instead of making a paper board like she did, draw it out with chalk! Word Find: Create a word find puzzle with sight words, your kids' names, words that fit a theme, like animals, trees, and so on, etc. Then, let them find as many words as possible...or tell them what words to find. Colored Shapes Game: Draw different shapes in various colors around the driveway. Then, give your kids directions on what to do: “Run to the green circle! Skip to the pink heart! Jump on the orange rectangle!" My kids could do this forever! 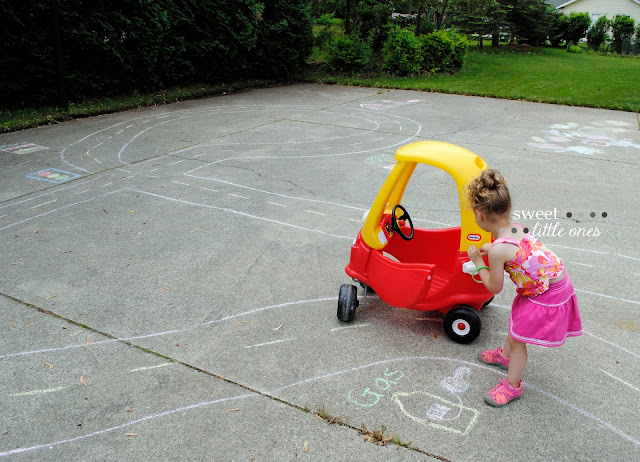 Chalk Rainbow: You can use paving stones or just draw out circles to fill in on your driveway or patio. Nature Color Hunt: Have your child match the color to something from nature. Sidewalk Simon: An action color memory game. Shape Drawings: Have your kid pick a shape and then create a person or image only with that shape. 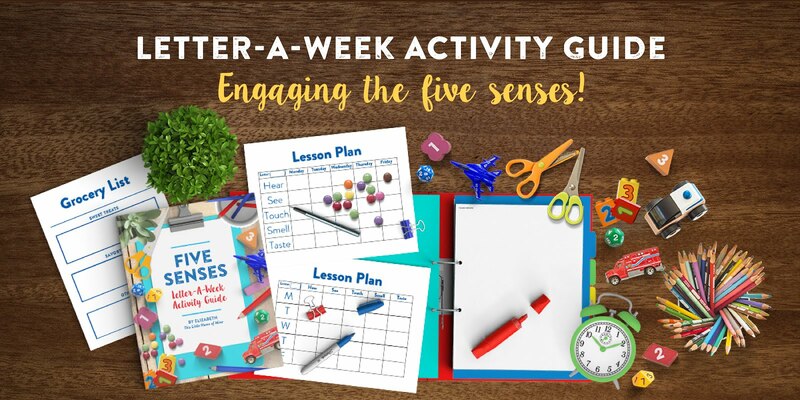 Games that combine learning numbers, ABCs, shapes, colors, math, reading, science, following directions, hand-eye coordination, gross and fine motor skills, etc. Connect the Dots: Draw dots in the outline of a letter, number, shape, image, or whatever you want. Then, starting with the first dot and the number 1, label each dot in order. Or you could do even numbers, odd numbers, multiples of 5 or 10 - any number pattern you want to teach your child. You could even use the alphabet and put a letter by each dot. Last, have your child connect the dots in the correct order to see what it will become! Hopscotch: This game can be done the classic way with numbers, or you can change it up by using letters, shapes, etc. Lily Pad Hop: Draw out lily pads with the chalk and put a letter, shape, sight word, number, etc. in the center of every lily pad. Then, let your little frog hop and learn! Chalk Bean Bag Toss: Have your child toss the bean bag at a number, letter, shape, etc. They can score points depending on how close they are to their mark! Chalk Constellations: Help your child to use rocks and chalk to draw out the constellations of the stars. Chalk Solar System: Draw out the planets in order. 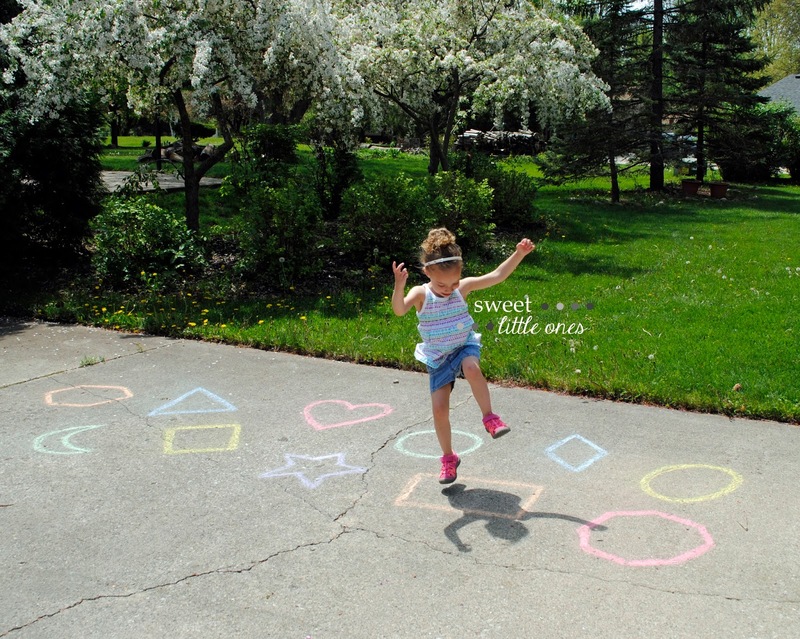 Play hopscotch! Chalk Treasure Hunt: Can you find 3 green leaves? 2 yellow flowers? Chalk Splash: Give your child a letter, number, shape, etc. - then they have to squirt the correct one with water. This can be done with water balloons too! DIY Sidewalk Chalk Paint: This sidewalk chalk paint recipe is so easy and made out of edible ingredients...just in case! You can use it for any of the activities on this list or just to draw. Definitely add it to your Summer Bucket List this year! We loved it - it was so fun! Art Teacher: Obviously, you can just draw with sidewalk chalk too! You can give your child directions on what to draw, like an orange oval or a yellow star. You can use art to teach anything - colors, following directions, shapes, etc. Draw a Scene: Draw a simple scene, like the ocean, a garden, the sky, a forest, a farm - and then you and your child can add animals, plants, people, and objects to the scene. It's fun to see what your child dreams up! Art Story-Telling: To go along with Draw a Scene above: after you're done (or even while you're drawing it), make a story to go along with it. I love hearing my kids tell stories! Tracing: Give your child something to trace - a leaf, a rock, a garden hose, their hand, your body! J was intent on making her sun exactly like mine! Copycat: You draw a picture of something, and then have your child copy it. Body Outline: Trace your child's body, and then let them decorate it. Treasure Map: Hide a "treasure" somewhere in your yard. Then, draw a map - X marks the spot of the treasure! 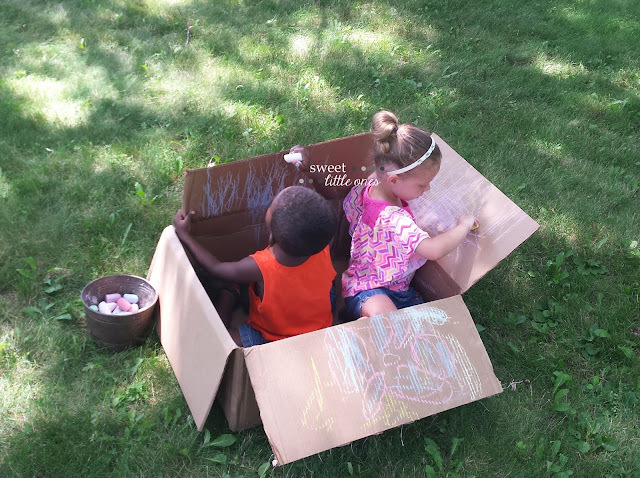 On a Box: Like this, but an outside boredom buster: let your child go to town with sidewalk chalk on a box! 3D Chalk Art: Draw a scene, and then add your child to it! Chalk Dress Up Dolls: Trace your child and add real clothes and shoes to their body. Splat Painting: A fun and messy water balloon game! Handprints and More: Chalk + wet hands = lots of fun! Chalk Puddles: A game to play in the rain! Chalk Ice: Cool sensory artwork for a hot day! What big sister doesn't love telling her little brother what to do? Ha! 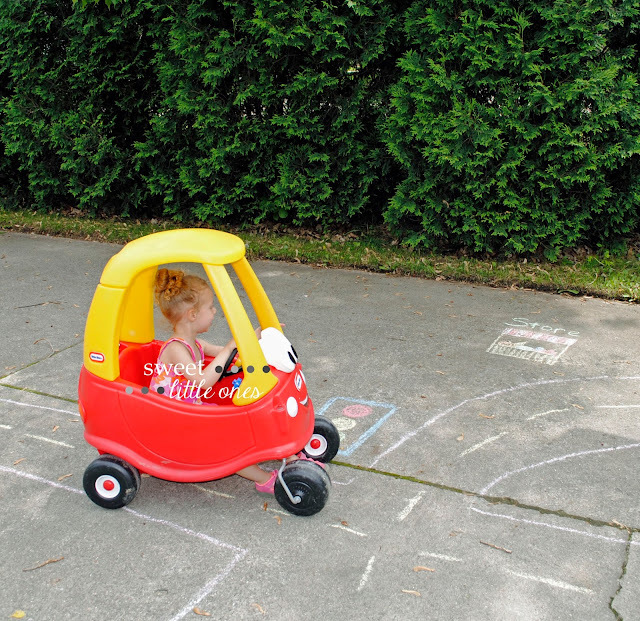 Destination Pretend Play: Draw out various destinations along your road - it doesn't have to be perfect. We like using these places: Home, Gas Station, Store, Zoo, Farm, and Park. Then, give directions on where to go. When you arrive at your destination, stop and do some pretend play! Fill up the "car" with gas, pick up veggies at the store (what color are they? ), make animal sounds at the farm or zoo, etc. The possibilities are endless! Sight Words: Going along with the pretend play, write out the name of each destination right next to it. Say the word and spell it out when you arrive at your destination! Which way do you turn to get to the store? 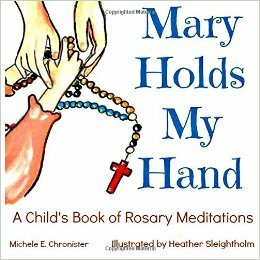 Learning Directions: This can go along with the pretend play as well. Tell your child to go left, right, or straight ahead. Or when they are heading towards a destination, ask them which way they have to turn to get there. 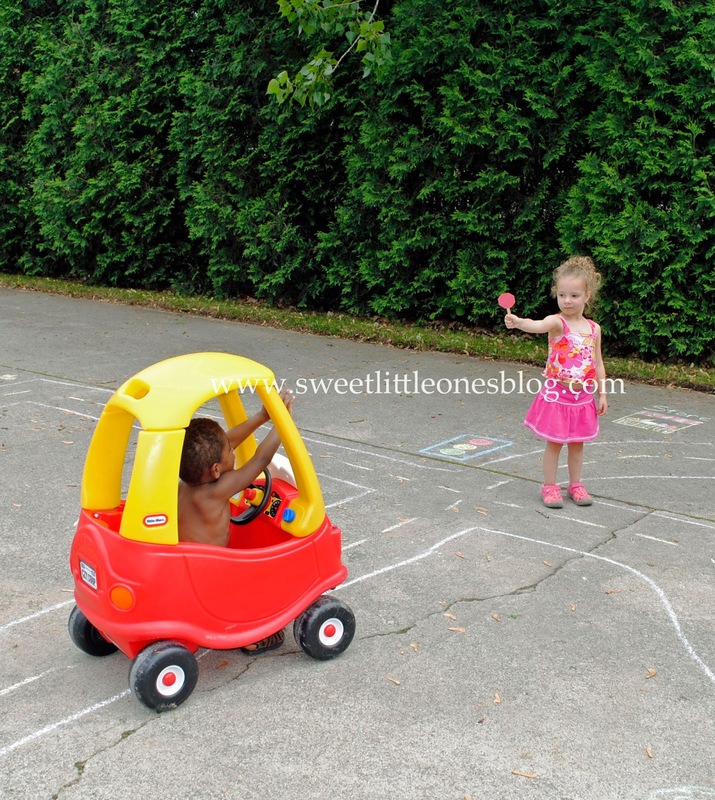 Outdoor Roads or Tracks: Chalk roads for little cars, trucks, and trains. Car City: Like our pretend play that I mentioned above, but for little cars. 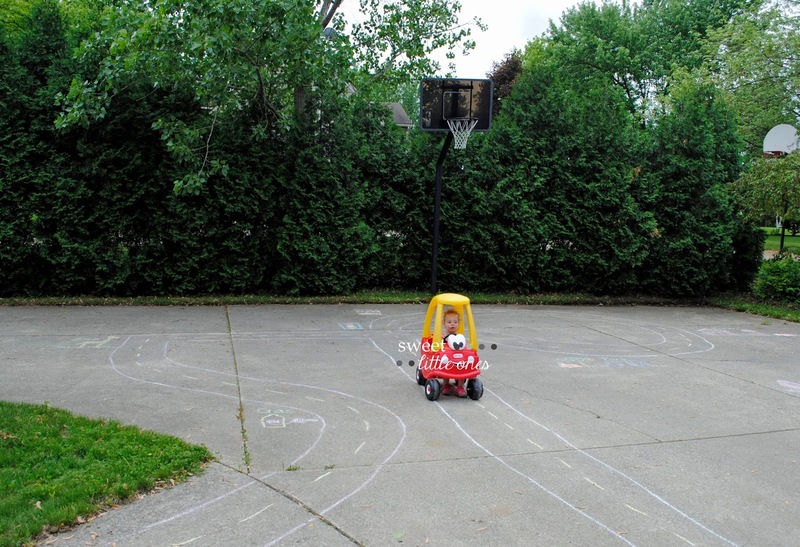 Chalk Maze: A little maze for little cars. Tic Tac Toe: Make a Tic Tac Toe board and use bean bags, rocks, or other objects as markers. Hopscotch Board Game: A fun, twisty-turny, action-packed game that kids will love! 4 Square: A game every kid has played! Get Up & Move Dice: Chalkboard painted "dice" with actions - roll the dice and do what it says! Obstacle Course: An action-packed chalk game! Below I have posted 1 affiliate link so we may receive a small commission at no extra cost to you if you make a purchase after clicking on this link. 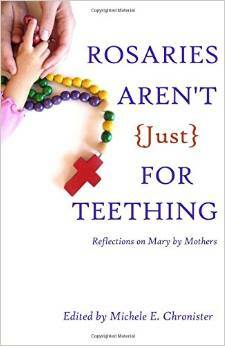 Please see the disclosures and policies page for more information. Chalky hands. No one likes it. You can get a chalk holder, like these from Melissa and Doug (we found our chalk holders in the Dollar Spot at Target this Spring), or you can do something a lot more simple with something you already have: a wet rag or wash cloth. We bring out a few wet wash cloths, and whenever our hands start feeling too chalky, we clean them with the wash cloth. Quick and easy. 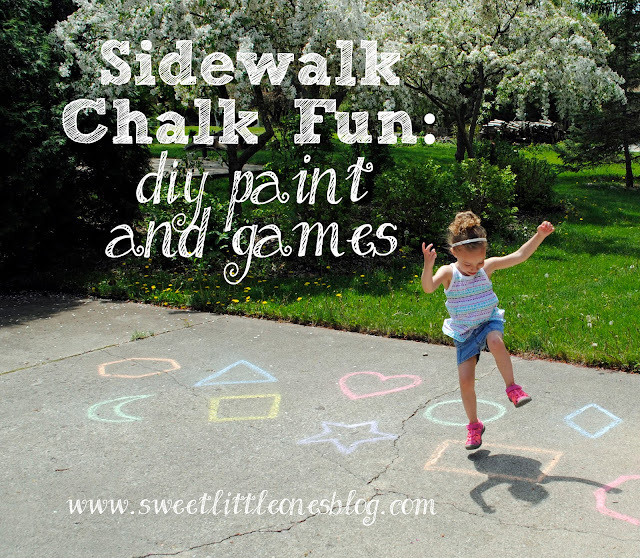 We have so many sidewalk chalk games to play and new ones to try out this summer! My kids are going to love it! Do you have any more to add to the list? 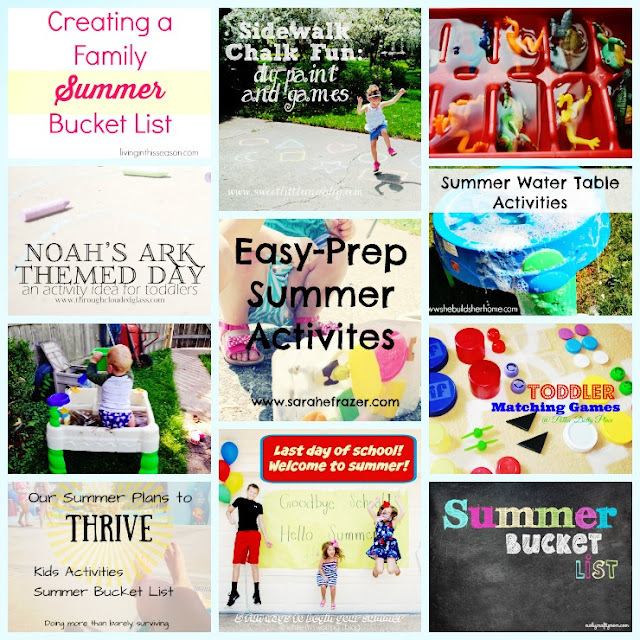 Oh, and don't forget to check out the other 10 awesome summer activities linked up below in the Summer Fun Blog Hop! I hope you have a great start to your summer! and family fun activities for the Summer! Summer is approaching, and today some friends and I are sharing some of our favorite summer tips, activities, and bucket lists. Hop around and find some new ideas for your summer of fun! 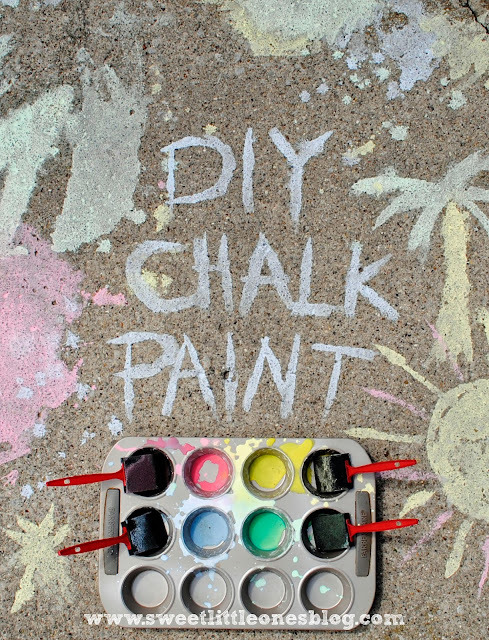 And don't forget to check out the first post in the Sidewalk Chalk Fun Series: DIY Chalk Paint. 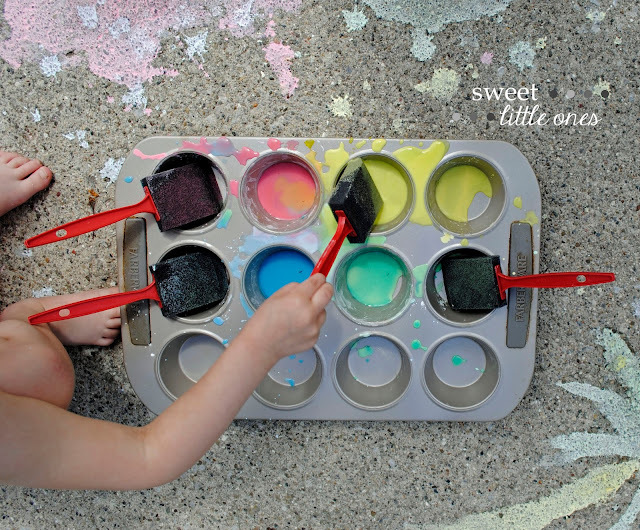 Another fun chalk activity your kids will love! I love it. We can use some of these today! This is the best round-up of chalk ideas I've ever seen!! 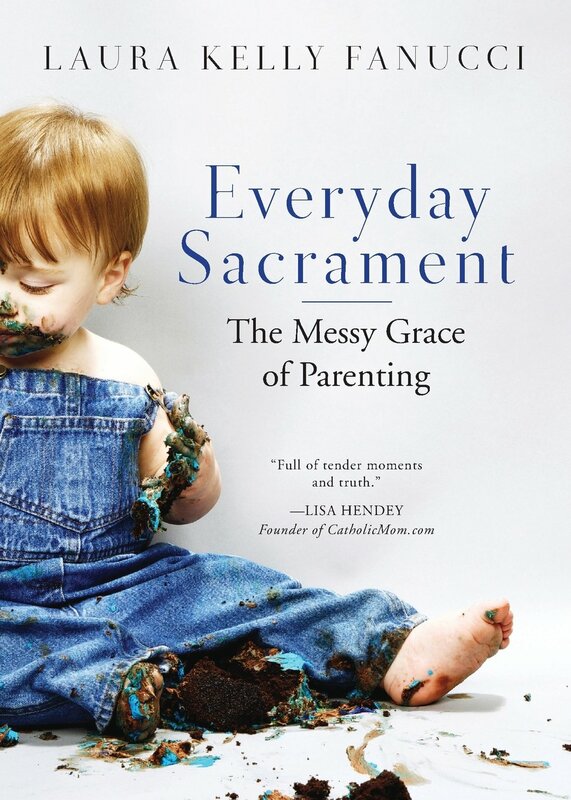 Something for every kid - Love it!! The chalk road!!! That's awesome! So many amazing ideas! Thanks for sharing! I am going to put my big girls to work on doing some of these activities with my littles while we are trying to get our house sold! Thanks for this! Wow! A lot of fun ideas here! Thank you! I love the shapes and colors game - my 2 year old would have so much fun with that! 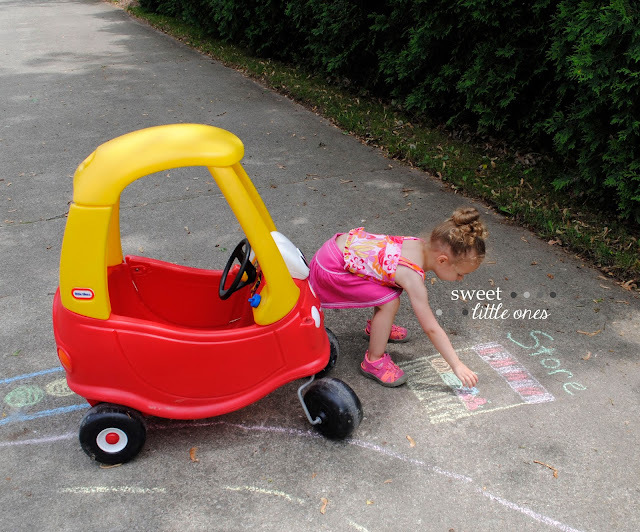 We have just started using chalk outside with my one year old and these are awesome ideas! Thank you! These are such great ideas! Going to have to save this for sure! This may sound so silly, but I grew up without a sidewalk to chalk on... Now that my kids have one, I kind of come up blank on what they can do with it. These are great ideas! This is is a great idea. 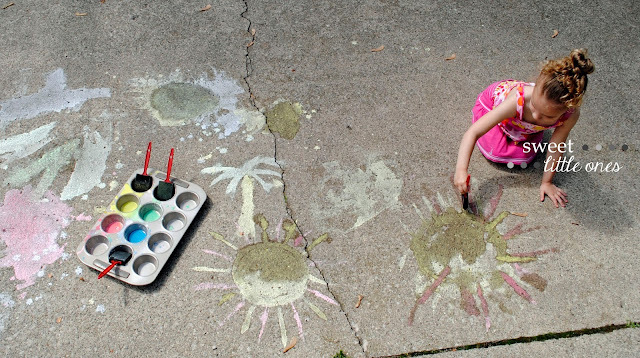 My daughter always loves playing with chalk outside, but I always run out of ideas of what to draw...not any more!! Thanks for the great summer fun idea and for linking up at the Thank Goodness It's Thursday party. I can't wait to see what you link up tomorrow! These are such awesome ideas, thank you!! My son is a year and a half, so he's too little for many of these (but I'll save for future use) BUT he loves driving his car and would get a big kick out of having a "road" to drive on. Love these!! We actually just bought sidewalk chalk today! 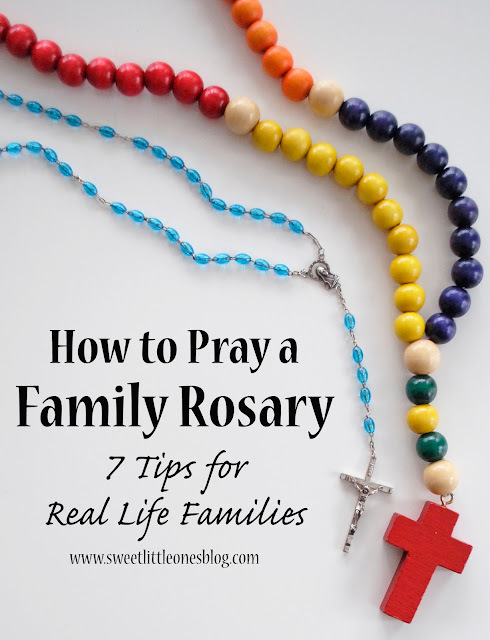 You have some great ideas and I'll definitely be playing these games with my little ones! Visiting from Merry Monday. These are great ideas! I bookmarked this post. I want to try some of these things with my two grand kids. Thanks for sharing at Merry Monday!